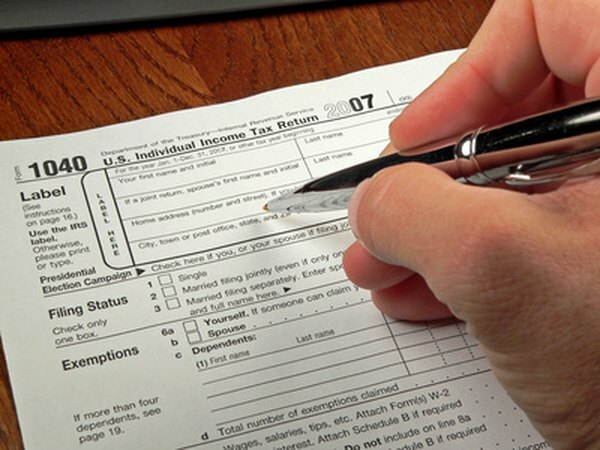 You must include gains from stock sales when you file your federal income tax return. When you sell a stock for more than you paid for it you make a profit. The Internal Revenue Service refers to this profit as a capital gain, and wants its fair share in the form of capital gains taxes. As long as you've kept good records, you should be able to figure your capital gains tax without much trouble. Your tax on a stock you sell is based on the difference between how much you paid for it and how much you sold it for, as well as whether you've held it for a year or more. The capital gain on a stock is the amount you bought it for including commissions, called the basis, subtracted from the amount you sold it for, including commissions. For most basic stock purchases, your basis is the price you paid for your stock plus any additional costs associated with making the purchase, such as brokerage fees, commissions, transfer fees or recording fees. If you acquired your stock at different times, you need to identify which shares you sold. This could make a difference between having a short-term or long-term capital gain. Once you know your basis, determine your net proceeds from the stock sale. A positive capital gain on a stock results from the sale price of the stock, less any costs associated with making the sale, such as broker commissions and fees, being greater than zero. Subtract your net proceeds from your basis. If the result is a positive number, you have a capital gain. If the result is a negative number, you have a capital loss that you might be able to use to offset other gains. Then, check your purchase and sale dates. If you owned the stock for one year or less, the IRS considers the resulting gain or loss to be short-term. Short-term capital gains on stock trades are taxed at the same rate as your ordinary income. If you owned the stock for more than one year before you sold it, the IRS considers the resulting gain or loss to be long-term. Long-term capital gains are typically taxed at a rate of 15 percent, though some very high income taxpayers pay 20 percent and some low income people pay zero. This is also the dividend tax rates for shareholder payments classified as qualified dividends. Figure your gains or losses from all of your stock disposition transactions on IRS From 8949, then transfer the results to IRS Form 1040, Schedule D. Complete Schedule D to determine your tax liability for the sale. There are other methods of determining your basis if you acquired your stock though a method other than purchase, such as an inheritance or gift. The most common form is using the fair market value of the stock immediately prior to you taking possession of the stock, or when the person passed away in the case of inherited stock. The estate administrator or executor should be able to tell you the appropriate basis in the case of inherited stock. For tax year 2019, there are three long-term capital gains rates -- 0, 15 percent and 20 percent. Most taxpayers will not pay more than 15 percent net capital gains tax. If you're in the 10 or 12 percent ordinary income tax bracket, you may not have to pay any tax on some or all of your capital gains. But if your taxable income exceeds the maximum allowed for the 37% ordinary income tax rate, you'll be looking at a 20 percent capital gains tax rate. Short-term capital gains continue to be taxed at your ordinary income graduated tax rates. In 2018, your long-term capital gains tax rate also depends on your ordinary income tax bracket, with the same rates of 0, 15 percent or 20 percent. You might be able to offset some of your stock sale capital gains with stock sale capital losses. Long-term gains from the sale of some types of stock, such as Section 1202 qualified small business stock, may be taxed at up to 28 percent.